- The game jumps to the title at the end of the game. 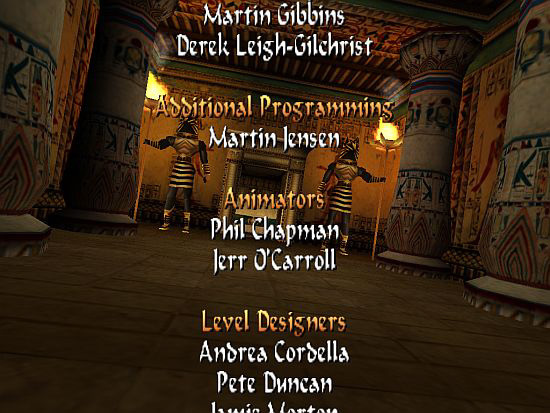 - The game jumps to the title at the end of the game, showing the credits list. - Typing X+2, the game jumps to title if the trigger has been activated. b, the original credits list of TRLR starts. 1. It seems the flyby under the credit list doesn't always start with the first camera of the first sequence (as opposed to the title flyby you can see usually). I think it starts from the camera that was just used when you left the title level last before. 3. If you see a black screen instead of the title flyby and the list then maybe it's some configuration (resolution?) problem. - New basic fonts for the whole game (including the texts of the credits list), editing font.pc in graphics\wads folder. - New fonts for the whole title (including the texts of the credits list): put a FONT_GRAPHICS object into the WAD of the actual level - i.e. the title this time - (get the object from the new font demo project of Paolone), then use NG Font Editor in NG Center\Tools. *: 'Old entries' mean now all the texts (except: the text of Legend Script command) you can see anywhere in TRLR and TRLE as well. Including the texts of the credits list. This GlobalTrigger also works when the game starts, after you've clicked on tomb4.exe. That's why the audio in Level command is absolutely useless now, practically: the game will always play the audio in title that is defined by the GlobalTrigger. But you can change the task names. After updating them, build the script. - you want to trigger/show/customize something you can't do in the original credits list/in the title level. 1. Lara reaches the end of the last level of the game. A usual FINISH trigger is being activated there, loading Lara into another level - i.e. into the level, where the new type credits will show up. 2. When the credits level starts, a Flyby sequence also starts at once. Lara can't move and maybe she's absolutely out of the POVs of all the cameras. (It depends on how you placed and adjusted the flyby cameras.) The sequence is endless, and you can't interrupt that by hitting the Look key. 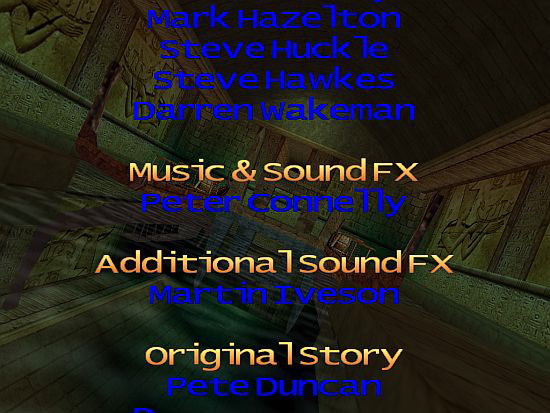 When the level starts, the credits list also starts, scrolling vertically from below upwards. When the last entry of the list is just out of the top of the screen then the game loads the title level. The entry of CUST_TEXT_ON_FLY_SCREEN is needed or else the list won't be printed on the screen of a flyby sequence! GlobalTrigger#2 says if the ExtraNG#0 entry (i.e. the first entry of the list: 'Story of The Game') is printed on the screen, then TriggerGroup#3 will be activated. (Because of technical reasons, the GlobalTrigger works only once - see: FGT_SINGLE_SHOT flag. So, GlobalTrigger#3 says if the ExtraNG#1 entry (i.e. the second entry of the list: 'AkyV') is printed on the screen, then TriggerGroup#4 will be activated. TriggerGroup#4 defines the color and position for the next text (the third entry of the list - that is written in ExtraNG#2) and then prints that on the bottom of the screen, scrolling that vertically upwards. Then, GlobalTrigger#4 says if the ExtraNG#2 entry is printed on the screen, then TriggerGroup#5 will be activated. TriggerGroup#5 defines the color and position for the next text and then prints that on the bottom of the screen, scrolling that vertically upwards. As X (see above) is 8 now (for example), then 10 means this trigger will load the title level (without the original credits list). The '@Credits_special_thanks.txt' in ExtraNG#5 means: 'the contents of Credits_special_thanks.txt in Script folder'. 2. TextFormat Script command in the [Level] block of the credits level can give default values (color, position) to the texts of the list. 3. Use 'Text. Vertical Scrolling of ExtraNG <&>string with (E)formatting data' FLIPEFFECT trigger instead of 'Text. Vertical Scrolling of ExtraNG <&>string with (E) speed' FLIPEFFECT trigger, if you want. But in this case it's not 'Text.Set' triggers or TextFormat commands that will add forming values for the scrolling, but PARAM_PRINT_TEXT Script constants will. 4. You can also form the texts of your own credits by font.pc or FONT_GRAPHICS (see above). 5. See more about fonts and texts in Paolone's new font demo project. 6. Except the setup you've just read, you don't need to do anything special in the credits level. So build the level as you build levels usually (including creating its [Level] block), use that setup - and it will work successfully as your own credits level. Place a Camera or Fixed Camera and another object that the camera will shoot, then activate them in TriggerGroup#2 instead of a flyby camera trigger. Also use a Keyboard FLIPEFFECT, in that TriggerGroup, to disable all the movements of Lara (that's why she won't be running around in front of the camera or won't be able to abort the camera). Use a Text FLIPEFFECT in the title level so that you can print on the title screen for the player that 'hit C to see credits'.